Andrew Jones MP was impressed with the Town Centre Survey. Harrogate MP Andrew Jones believes a more 'varied and integrated' approach is needed if the town centre is to prosper in the future. Responding to The Harrogate Advertiser's Town Centre Survey, the MP for Harrogate & Knaresborough, said he was impressed by the passion of our readership and said that plenty of good ideas had been put forward. Here, in his own words, is his response to the points made. He said: “I thought it was a very good survey and a good piece of work by the Harrogate Advertiser. The number and quality of responses is a sign Harrogate people are engaged in the future of the town. “It brought forward some really interesting comments. People clearly want the town centre to be successful. “I think we need to keep a very open mind. The existing model of the town centre and the high street need to evolve. Andrew Jones said: “I was a little surprised at the survey’s results on things like litter and beggars. “I live in the town centre and my office is not far from the One Arch. “I view Harrogate as a very attractive place to come to and we’ve got all the ingredients to make it successful as we go forward. Andrew Jones said: “Business has gone online and isn’t coming back. “We need to encourage people to use retail sites but that will require a broader effort. Rates and rents: are they too high? Andrew Jones said: “In terms of rates and rents for town centre shops and other businesses, since the Government reassessed business rates last year the business rates in Harrogate have come down by four and a half per cent on average. “Rent is a different question. It’s a private deal between landlords and their tenants. At the heart of the question is the final composition of the town centre. 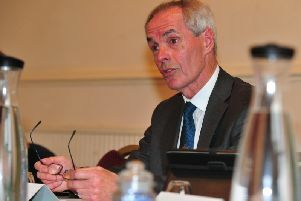 Andrew Jones said: “Having had experience of pedestrianisation, I think it would be controversial and polarise opinion. “The Harrogate Advertiser’s survey showed that it’s a key thing for some people and for other people it’s the opposite, it’s cheaper or free parking. “Whatever we do, we need to make it easy for all people to visit the town centre, that’s why I’ve supported policies for better transport. “I’ve seen pedestrianisation done effectively elsewhere; it can be a good thing in making it easier to get around and increasing footfall. “As for parking, the council is making efforts to improve matters with its new app to help people park. Andrew Jones said: “I support independents wholeheartedly. They are often a source of innovation and individuality. “They add a lot to what Harrogate has to offer. More live events in the town centre? Andrew Jones said:“The principle of having more live events in Harrogate town centre is a good idea. “I’m all in favour of it. “The Festival already puts on a lot of wonderful events and I supported bringing events like the Tour de France to Harrogate. “One of the most marvellous weekends I’ve ever had in Harrogate was when the Tour de France came.